New Engine 282 in the works! Yes we are getting a new engine! From our partners at Patriot Fire: Rosedale VFD (Baltimore County, MD.) 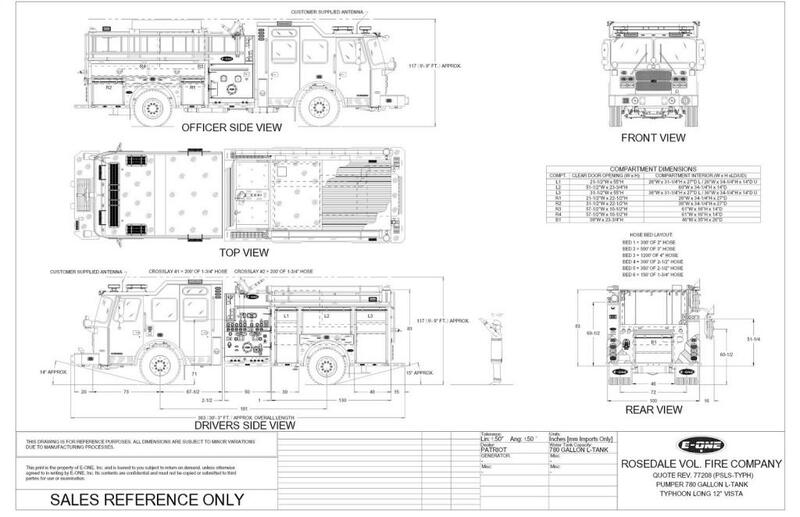 has ordered a new E-One Typhoon Extreme Duty Pumper. This pumper features a custom Typhoon long cab, 12″ full height vista, barrier style doors, severe duty interior, seating for six firefighters, 911 series seats, Cummins L9 450 hp engine, Allison EVS 3000 transmission, Hale QMAX 1500 GPM, 304L stainless steel body, driver side body with rescue style full height 30″ front, 40″ rear and 60″ wide fender panel L2 Compartment; Officer’s side body 3/4 side with 30″ forward and 40″ wide rear compartments and (2) equal size upper compartments. Includes a 60″ wide fender panel, 780 gallons of water; Whelen emergency and scene lighting. WELCOME TO THE PATRIOT FIRE FAMILY! !